Work on the pirate-y town of Port George continues! You’re likely aware that I have a fair few run-down buildings for my town already, so it’s time for something different. My grand vision is to have two distinctly different sides to Port George. One is the grimy, pirate side that I’ve been building so far, with mainly wooden buildings, plenty of sand and all in all a hive of scum and villainy. The second is a “proper” side – a fairly prosperous British colonial town, with brick buildings, less sand and marginally less villainy, or at least of a different kind. The idea is that both of these halves should work as standalone towns as well as combining into a larger whole – maybe separated by a river or something similar. With limited time for building terrain, the more uses I can find for things, the better. Finding suitable buildings was surprisingly challenging, everything looking either too modern, too old or just stylistically off. As with all the historical accuracy in the project, I wanted to strike a balance between accuracy and pleasing aesthetics, with the latter taking precedence if the first wasn’t jarringly off. Again, “what would this look like in a pirate movie?” was a key question. 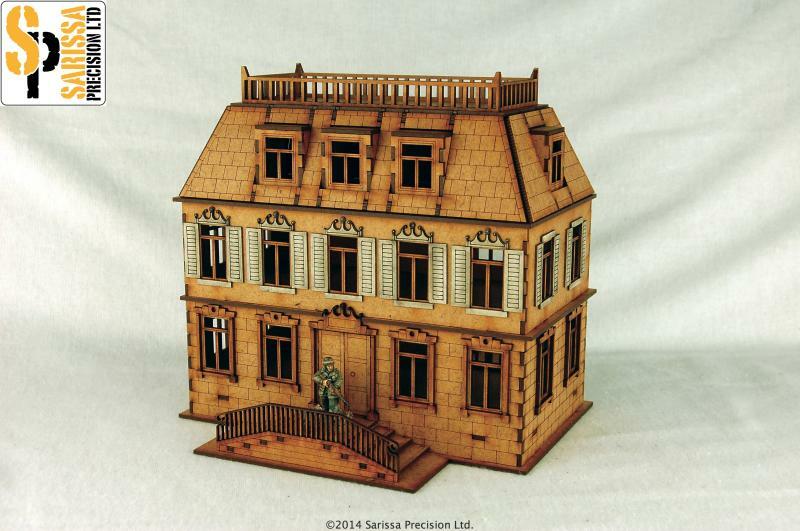 Sarissa Precision Chateau. I’ve been eyeing this piece for ages. It’s super impressive, with lovely detailing. A bit too lovely, as I managed to snap some fiddly bits while putting it together. Nothing catastrophic, luckily! This will serve as the mansion of Port George’s governor and will be the centrepiece of the fancier part of town. I’ve added Warbases roof tiling to the roof, obviously not shown in the catalogue image. The levels are separate, so the inside is playable too. TTCombat Venetian house. A nice, simple and suitably generic piece. I bought a pitched roof to go along with it. Both roof styles are removable, so if I want to use the building with a roof terrace, that’s possible as well. The line of Venetian buildings – intended for the game Carnivale, I assume – is really nice, and provides me with excellent choices for expanding the town. 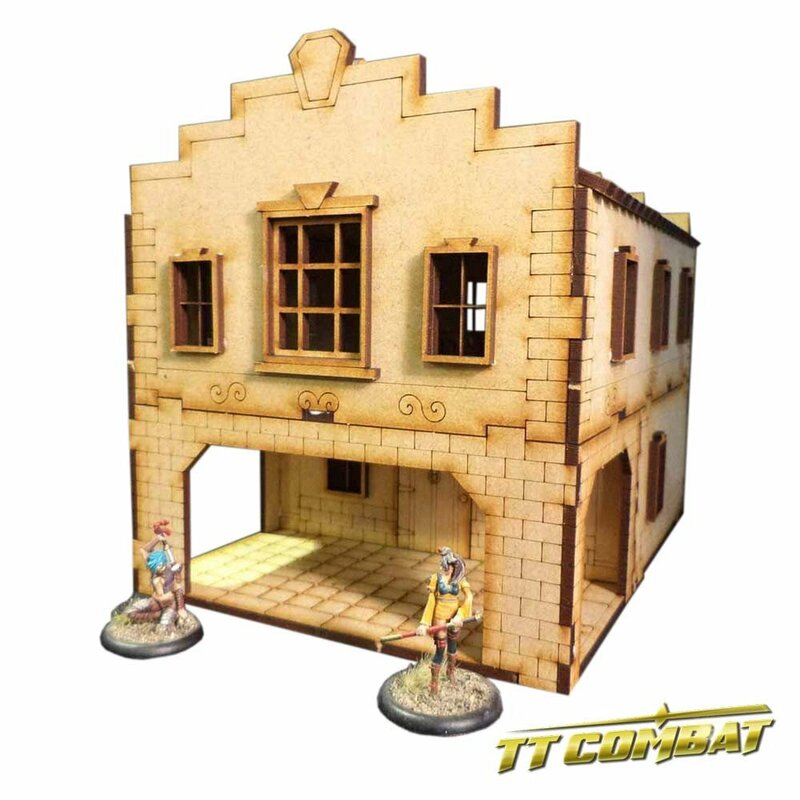 TTCombat Old Town townhouses. Some more TTCombat pieces, these are intended for Malifaux. Both are large, impressive pieces. 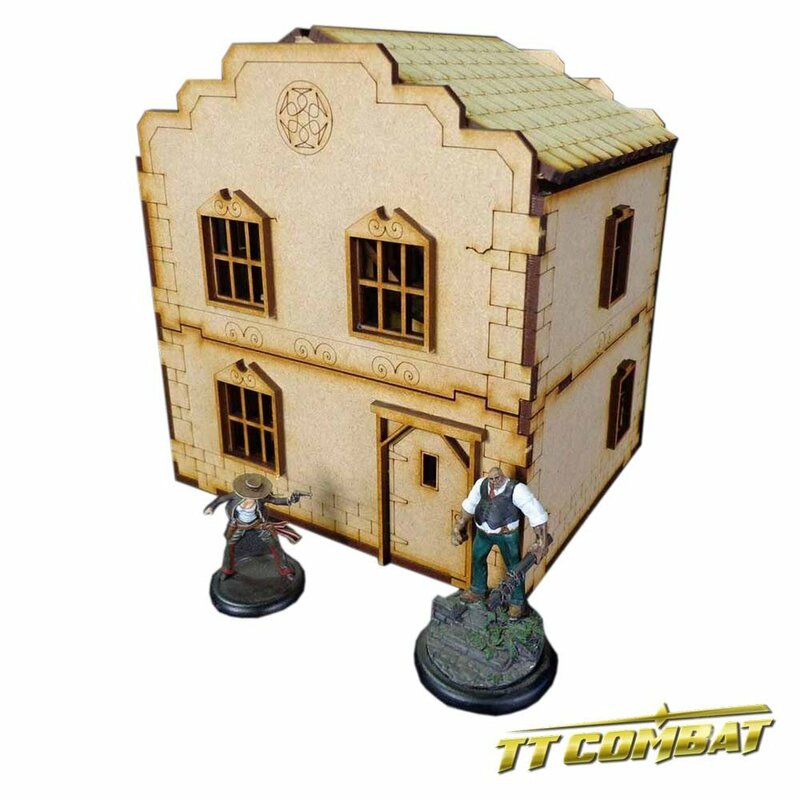 The TTCombat stuff is much chunkier than the Sarissa building, meaning it’s both clunkier and sturdier – you win some, you lose some. 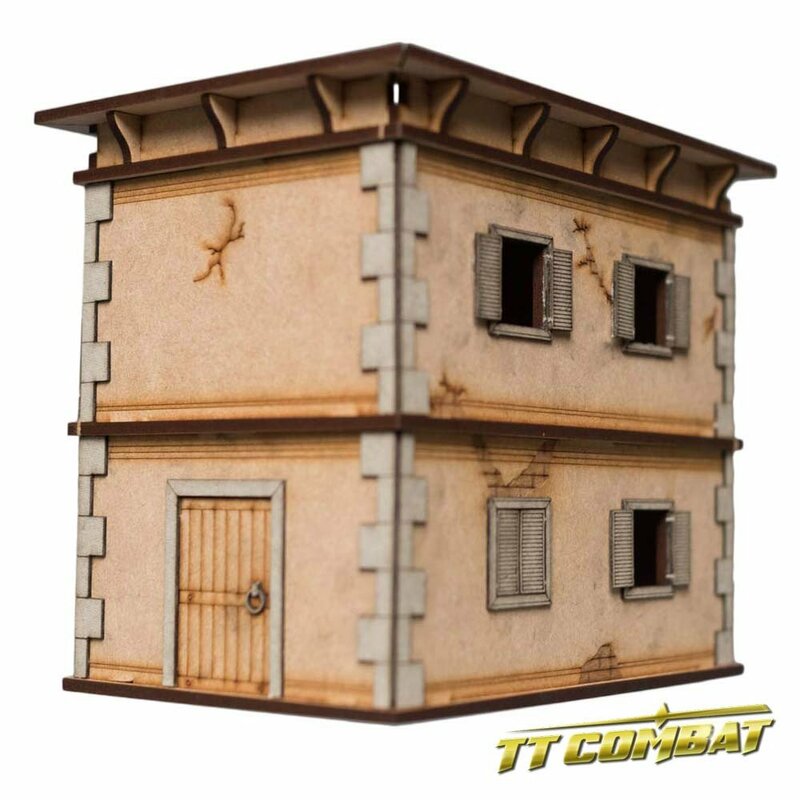 All the TTCombat buildings have separate floors and the interiors can be used for gaming. There are even stairs connecting the two floors in the townhouses, as well as some super chunky furniture. My only gripe with the TTCombat stuff is the massive size of the doors. Even on a very large 28/32mm miniature the doorknobs are around shoulder height. It’s a minor thing and could be easily fixed, but I don’t think I’ll bother. 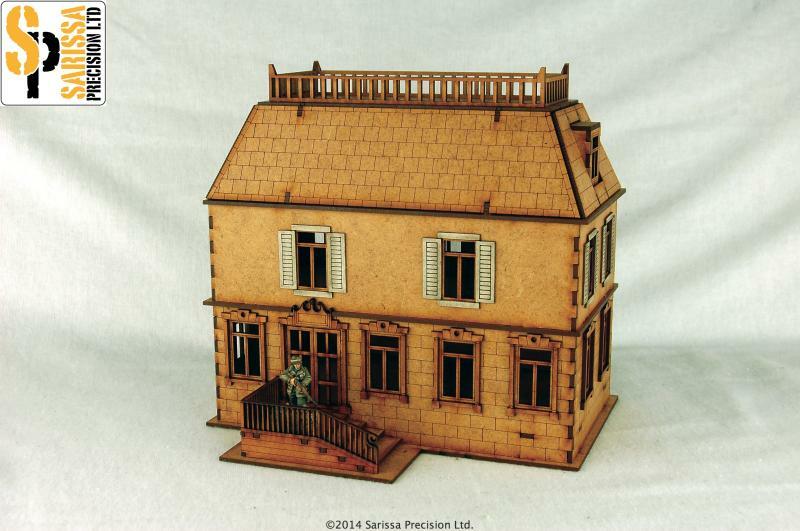 Warbases roofing tiles will be added to the townhouses to unify them with the rest of the buildings. Warbases modular #5. 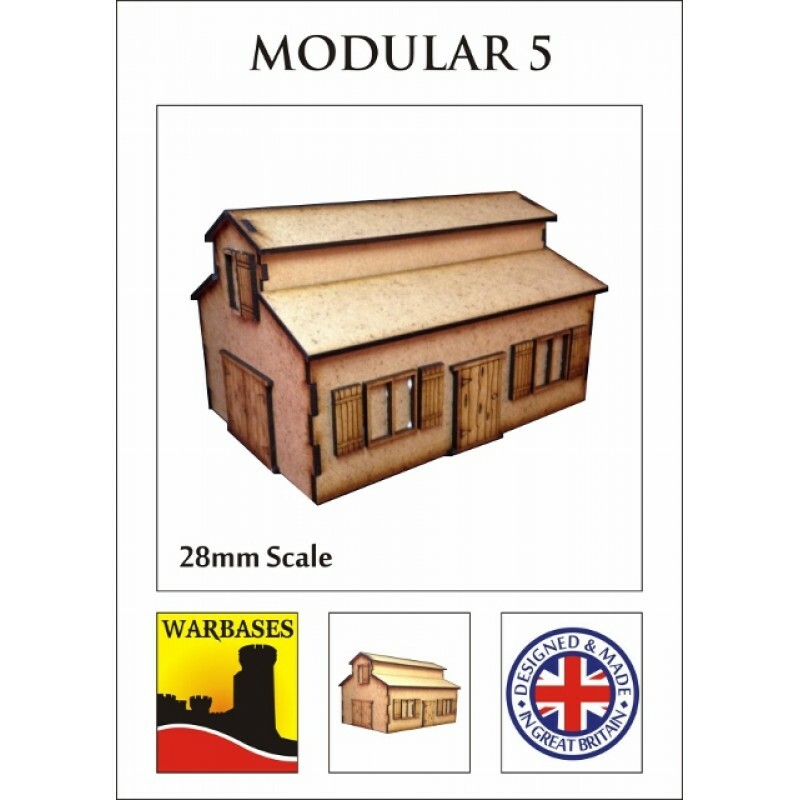 The Warbases modular buildings are super simple (and super cheap). I’m thinking of modding this with a portico and some nicer windows and doors. I think it has a tavern look to it, so it could function as a sort of go-between uniting the two halves of the town. My attitudes towards laser-cut mdf buildings have changed in the past year or two. I used to think very little of them, but after climbing on board the mdf train, I’m definitely seeing the appeal. There’s a huge variety, ample chance for customising and the prices are very decent. Putting them together can be quite satisfying, too! So, what do you think? Does this look suitably colonial? What do you think of mdf? Does it show that I’ve been alone, writing my dissertation at our summer place in the archipelago, and am starting to crave human interaction? Great selection. I’m generally sceptical about MDF, but I’ve already seen what you can make of it, so I’m sure it will turn out great! And all the best with your dissertation, enjoy it, I remember writing mine… trust me, you’ll never again have the chance to concentrate on one thing like that. Thanks for the comment! The dissertation work is indeed a double-edged thing – it’s fun to concentrate on, but I long for the day it’s finally finished. I think the style fits the pirate theme. I am normally not a fan of unmodified mdf, with the exception of some Sarissa pieces. They really show what can be done if materials are cleverly combined. That said, as a basis for further improvements I would say mdf is very good. You always get an accurate fit and can concentrate on covering the walls, new window fittings etc. All the best with your dissertation, glad my thesis is finished, was a bit of a up and down, but that is true of all things worthwhile in life ;). Cheers daggerandbrush! I’ve yet to paint an unmodified mdf building, but I’m looking forward to seeing what can be achieved by painting. Judging from some of the photos I’ve seen, it’s possible to get really nice looking buildings without excessive modification – we’ll see! If you paint them I recommend a sesling coat of shellac. Works well to prevent warping of mdf and also limits the absorption of paint. Great choices and a great post. I’m loving the idea of the divided Port George and look forward to seeing it all come together. I’ve been checking out mdf buildings on line for a while but have yet to buy any. They look great and im not sure why I haven’t bought any yet but after seeing these I might just dive into the wallet. Thanks ork! I think I browsed mdf for years before finally taking the plunge. I figured that if I’m ok with paper terrain, then why not mdf. The only thing bugging me is the Lego effect present in corners, but I’ll see what I can do with that (or learn to live with it). Great choices mate, I think you have the aesthetic defined very nicely for Port George. I suspect a little light texture will sort out your walls & corners… I find that GW Typhus Corrosion has a nice light texture that suits stone/brick very well. It’s quite watery though, so you might want to seal the mdf before applying it. Good luck with the dissertation btw!